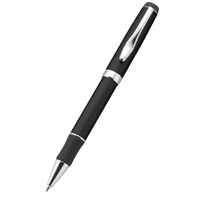 Always have a spare pen available to sign important legal documen's with this legal theme desktop pen stand. 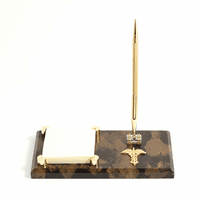 It features dual pen stands, each made of polished brass, mounted on a black marble base. The marble has unique gold veins running throughout. 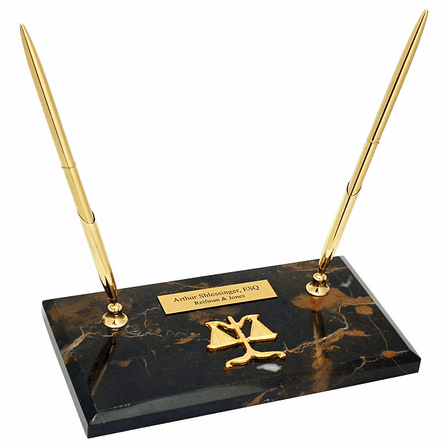 A brass Scales of Justice symbol , the symbol of lawyers, judges and legal professionals everywhere, is mounted front and center on the marble base. 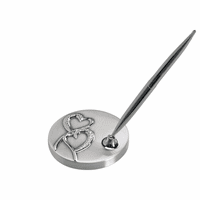 Add a laser engraved brass plate to the area above the legal emblem for a personalized touch. An ideal gift for lawyers, paralegals and judges, this dual pen set comes packaged in a gift box and ships out the day after your order is placed. HI. I was just wondering what the base is made of? Thanks. The base is made of solid black and gold marble. A font size of 35 is about as large as you'll want to go. You can use the Preview Personalization feature below where you enter the engraving instructions to see what your engraving will look like on the gold plate.